Inter Milan are gunning for glory in this season's Champions League but Gordon Law recalls the time when Crystal Palace gave them a beating at the San Siro. The scalp came in the Anglo-Italian Inter-League Clubs Competition - also known as the Anglo Italian Cup - which was a contest that pitted the top English and Italian clubs against each other between 1970 and 1973. It was set up to generate cash to cover the player wage bill over the extended close season due to the 1970 Mexico World Cup. And it also gave 1969 League Cup winners Swindon a chance to compete in Europe as they were not allowed to play in the Inter-Cities Fairs Cup for being a Third Division side. Palace entered the tournament in the summer of 1971 along with inaugural winners Swindon, First Division clubs Stoke, West Brom, Huddersfield and Blackpool plus Serie A champions Inter, Roma, Sampdoria, Cagliari, Bologna and Hellas Verona. Clubs were split into three groups of four teams, and bizarrely, league points were awarded for each goal scored. Up against West Brom, Inter and Cagliari in the "group of death", Palace got off to the perfect start with victory over a Luigi Riva-inspired Cagliari thanks to a Bobby Tambling goal at Selhurst Park. 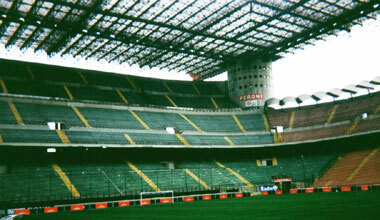 Three days later, Inter came to town and the Glaziers opened the scoring when Alan Birchenall pounced on a defensive error before Roberto Boninsegna levelled for the Italians with a brilliant individual effort. A 2-0 loss in Cagliari - Riva getting both goals - meant Palace crashed out of the tournament but there was still a mouth-watering tie with Inter to come. The last time Inter tasted defeat at home was seven months previously in November and Tambling stunned the Nerazzurri by firing Bert Head's side into the lead. Inter restored parity through Tarcisio Burgnich but Tambling struck a superb 25-yard rocket into the back of the net to give Palace a memorable victory over the Italian giants. Despite recording wins over Cagliari and Inter, Palace finished fifth out of the six English sides, because up against superior opposition, they had scored the least number of goals. Blackpool finished six points above Palace (actually scoring six more goals) and beat Bologna in the final. Thankfully, the points-for-goals rule was abandoned when Palace next competed in 1973. 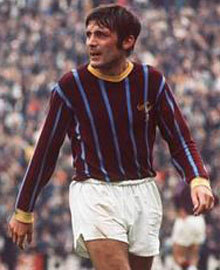 Held midway through the 1972/73 campaign, eight English sides entered the fray including Newcastle, Manchester United, Fulham, Blackpool, Hull, Oxford and Luton. Lazio, Roma, Fiorentina, Hellas Verona, Bologna, Como, Torino and Bari were the Italian participants. Palace again started the competition well, beating Verona 4-1 through goals from Martin Hinshelwood, Bobby Bell and a brace from Alan Whittle at Selhurst Park. Away to Bari, Palace came away with a fortunate 1-0 triumph thanks to Derek Possee's strike. Then in their next match, a weakened Palace side ran out 3-1 winners at home to Lazio as John Craven plundered a hat-trick, including one from the penalty spot, to become the first person in Anglo-Italian history to net a treble. Malcolm Allison's men - who were now relegated from the English First Division - travelled to Fiorentina for their final group match needing a point to make the semi-finals. It duly arrived as Possee hit two goals to set up a two-legged semi with Newcastle. The first match against the Magpies ended goalless at Selhurst Park and the Toon were comfortable 5-1 victors at St James' Park. Jim Cannon scored for the South Londoners and Newcastle later went on to lift the trophy. The Anglo Italian Cup was then scrapped due to a lack of interest and crowd trouble but Palace acquitted themselves well against Serie A opposition enjoying some memorable wins. And the next time commentators remark how few English sides have been victorious at the San Siro, just remember Palace did it in 1971 when the Italians had no answer to Tambling's wonder goal.